The sin-offering proper is a sacrifice consisting of either a beast or a fowl and offered on the altar to atone for a sin committed unwittingly. The rules concerning the sin-offering are as follows: If the anointed priest or the whole congregation commits a sin through ignorance, the sin-offering is a young bullock without blemish. Should the ruler so sin, his offering is a male kid without blemish. But when a private individual sins, his offering must be either a female kid or a female lamb without blemish, or, if he is too poor to provide one of these, a turtle-dove. Sin-offerings were brought on other occasions also. On the Day of Atonement the high priest inaugurated the festival with two sin-offerings—a bullock as his own offering, and a male kid for the congregation. The flesh of these was not eaten, but after the fat had been removed the carcasses were burned outside the camp (Lev. xvi. 3, 5, 10-11, 25, 27). A woman, after the days of her purification had been fulfilled, was required to bring a dove for a sin-offering, in addition to a burnt offering. A leper, on the day of his cleansing, was required to bring, besides other offerings, a female lamb or, if he were too poor, a dove for a sin-offering (Lev. xii. 6; xiv. 10, 19, 22). Sin-offerings formed a part of inaugural and dedicatory ceremonies. Thus, when Aaron and his sons were inaugurated into the priesthood, one of the sacrifices was a sin-offering consisting of a bullock, the flesh of which was burned outside the camp (Ex. xxix. 1, 10-14; Lev. viii. 14-17). Eight days later Aaron brought a calf, and the Israelites brought a small kid, as sin-offerings (Lev. ix. 2-10). At the dedication of the altar each of the twelve princes offered a male kid (Num. vii. 16 et passim). The sacrifices of those who returned from captivity with Ezra included twelve he-goats (Ezra viii. 35). The ritual of the sin-offering was as follows: If the victim were a quadruped, the offerer confessed his sins over the head of the victim and slew it himself (comp. Lev. iv. 4, 15, 24, 29). The place of slaughter was on the north side of the altar (comp. ib. i. 11 and ib. iv. 19 [A. V. 25]). The priest took some of the blood and sprinkled it before the veil (ib. iv. 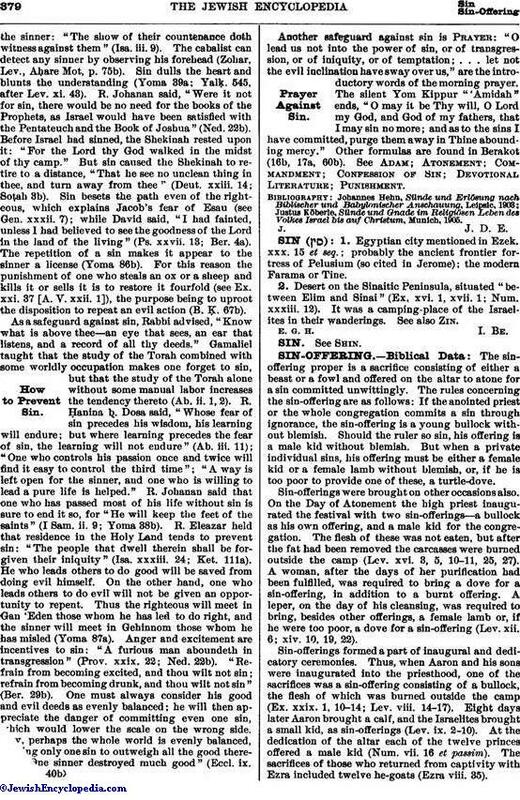 5 ), or, on the Day of Atonement, before the mercy-seat (ib. xvi. 15); this he did seven times, and then smeared some on the horns of the altar. The remainder of the blood was poured out at the base of the altar of burnt offering. The internal fat of the animal, with the caul, liver, and kidneys, was burned upon the altar of burnt offering. In early times the flesh belonged to the priests (comp. Hos. iv. 8 and Lev. vi. 22 ), though it was sacrosanct, making everything which touched it holy, and might be eaten by priests alone. The law of Lev. iv. prescribed that the flesh, together with the hide, head, legs, viscera, and dung, should be burned outside the Temple. 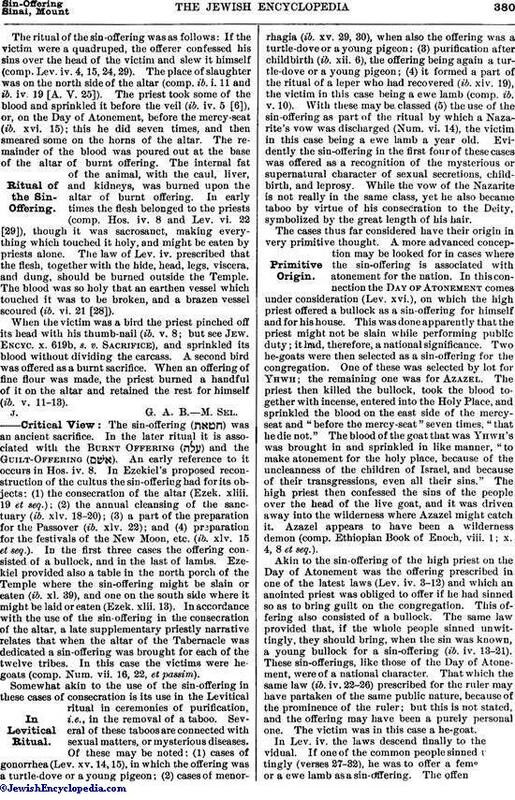 The blood was so holy that an earthen vessel which touched it was to be broken, and a brazen vessel scoured (ib. vi. 21 ). When the victim was a bird the priest pinched off its head with his thumb-nail (ib. v. 8; but see Jew. Encyc. x. 619b, s. v. Sacrifice), and sprinkled its blood without dividing the carcass. A second bird was offered as a burnt sacrifice. When an offering of fine flour was made, the priest burned a handful of it on the altar and retained the rest for himself (ib. v. 11-13). The sin-offering ( ) was an ancient sacrifice. In the later ritual it is associated with the Burnt Offering ( ) and the Guilt-Offering ( ). An early reference to it occurs in Hos. iv. 8. In Ezekiel's proposed reconstruction of the cultus the sin-offering had for its objects: (1) the consecration of the altar (Ezek. xliii. 19 et seq. ); (2) the annual cleansing of the sanctuary (ib. xlv. 18-20); (3) a part of the preparation for the Passover (ib. xlv. 22); and (4) preparation for the festivals of the New Moon, etc. (ib. xlv. 15 et seq.). In the first three cases the offering consisted of a bullock, and in the last of lambs. Ezekiel provided also a table in the north porch of the Temple where the sin-offering might be slain or eaten (ib. xl. 39), and one on the south side where it might be laid or eaten (Ezek. xlii. 13). In accordance with the use of the sin-offering in the consecration of the altar, a late supplementary priestly narrative relates that when the altar of the Tabernacle was dedicated a sin-offering was brought for each of the twelve tribes. In this case the victims were he-goats (comp. Num. vii. 16, 22, et passim). Somewhat akin to the use of the sin-offering in these cases of consecration is its use in the Levitical ritual in ceremonies of purification, i.e., in the removal of a taboo. Several of these taboos are connected with sexual matters, or mysterious diseases. Of these may be noted; (1) cases of gonorrhea (Lev. xv. 14, 15), in which the offering was a turtle-dove or a young pigeon; (2) cases of menorrhagia (ib. xv. 29, 30), when also the offering was a turtle-dove or a young pigeon; (3) purification after childbirth (ib. xii. 6), the offering being again a turtle-dove or a young pigeon; (4) it formed a part of the ritual of a leper who had recovered (ib. xiv. 19), the victim in this case being a ewe lamb (comp. ib. v. 10). With these may be classed (5) the use of the sin-offering as part of the ritual by which a Nazarite's vow was discharged (Num. vi. 14), the victim in this case being a ewe lamb a year old. Evidently the sin-offering in the first four of these cases was offered as a recognition of the mysterious or supernatural character of sexual secretions, childbirth, and leprosy. While the vow of the Nazarite is not really in the same class, yet he also became taboo by virtue of his consecration to the Deity, symbolized by the great length of his hair. The cases thus far considered have their origin in very primitive thought. A more advanced conception may be looked for in cases where the sin-offering is associated with atonement for the nation. In this connection the Day of Atonement comes under consideration (Lev. xvi. ), on which the high priest offered a bullock as a sin-offering for himself and for his house. This was done apparently that the priest might not be slain while performing public duty; it had, therefore, a national significance. Two he-goats were then selected as a sin-offering for the congregation. One of these was selected by lot for Yhwh; the remaining one was for Azazel. The priest then killed the bullock, took the blood together with incense, entered into the Holy Place, and sprinkled the blood on the east side of the mercyseat and "before the mercy-seat" seven times, "that he die not." The blood of the goat that was Yhwh's was brought in and sprinkled in like manner, "to make atonement for the holy place, because of the uncleanness of the children of Israel, and because of their transgressions, even all their sins." The high priest then confessed the sins of the people over the head of the live goat, and it was driven away into the wilderness where Azazel might catch it. Azazel appears to have been a wilderness demon (comp. Ethiopian Book of Enoch, viii. 1; x. 4, 8 et seq.). Akin to the sin-offering of the high priest on the Day of Atonement was the offering prescribed in one of the latest laws (Lev. iv. 3-12) and which an anointed priest was obliged to offer if he had sinned so as to bring guilt on the congregation. This offering also consisted of a bullock. The same law provided that, if the whole people sinned unwittingly, they should bring, when the sin was known, a young bullock for a sin-offering (ib. iv. 13-21). These sin-offerings, like those of the Day of Atonement, were of a national character. That which the same law (ib. iv. 22-26) prescribed for the ruler may have partaken of the same public nature, because of the prominence of the ruler; but this is not stated, and the offering may have been a purely personal one. The victim was in this case a he-goat. In Lev. iv. the laws descend finally to the individual. If one of the common people sinned unwittingly (verses 27-32), he was to offer a female goat or a ewe lamb as a sin-offering. The offenses whichdemanded a sin-offering are detailed in Lev. v. 1-6. They are for the most part of a non-moral nature, such as contact with a dead body, with an unclean reptile, or with an unclean discharge from a human being; but two of them have more of a moral character. These latter are (1) cases where a man permits injustice by withholding information (ib. verse 1), and (2) cases of rash though ignorant swearing to that which turns out to be false (ib. verse 4). A noticeable feature of Lev. iv. and v. is that the expense of the sacrifice is graded according to the dignity or wealth of the offender. Thus in ch. iv. the offering may be a bullock, a he-goat, a she-goat, or a ewe lamb, while in ch. v. it may be a she-goat, a ewe lamb, a turtle-dove, a young pigeon, or the tenth part of an ephah of fine flour (comp. ib. verses 6, 7, 11). It is clear that the sin-offering was not primarily an offering for real sins, but for the unconscious violation of mere taboos. It was demanded in the case of actual sins only sporadically, and then only to a slight degree. There is an exception to this in the ritual of the Day of Atonement; but the words in Lev. xvi. 16 which make the sin-offering cover real sins are probably of late date. 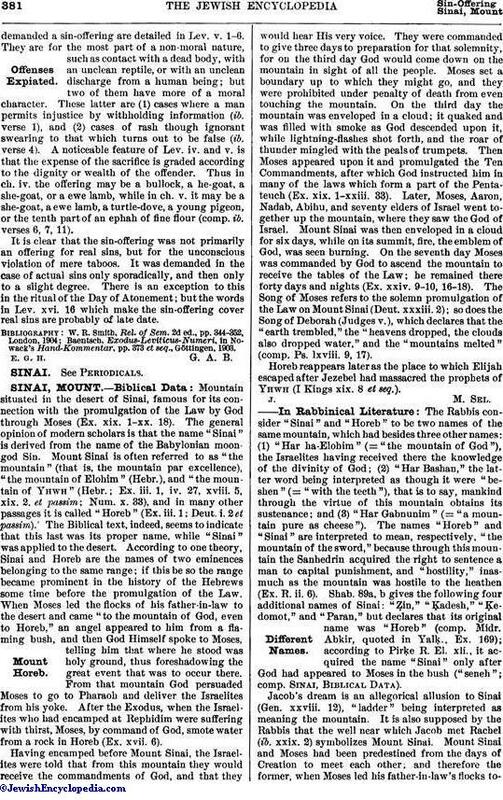 Baentsch, Exodus-Leviticus-Numeri, in Nowack's Hand-Kommentar, pp. 373 et seq., Göttingen, 1903.